Launched to an eager public in 1959, the Triumph Herald was hailed as a modern, stylish car by both the press and public. In it's initial form of 948cc engine the early Triumph Herald sold well all around the world with over 100,000 cars being produced. At a time of crisis there is little doubt the Triumph Herald kept many workers employed at Canley, Coventry building the cars and many companies afloat who supplied numerous parts and fittings. The Triumph Herald was initially available as a Saloon and Coupe in 1959 with a Convertible launched in 1960. The story of the Triumph Herald is fascinating, from its proving run through Africa to the Rallies of Monte Carlo, RAC and Tulip. Yet, today most of the stories and details regarding the Triumph Herald have been lost. This site is focusing on the era 1959 - 1961 and collating an archive of every 948cc car built, where they were exported to and snippets of information sent through from enthusiasts, Standard Triumph employees and their families. 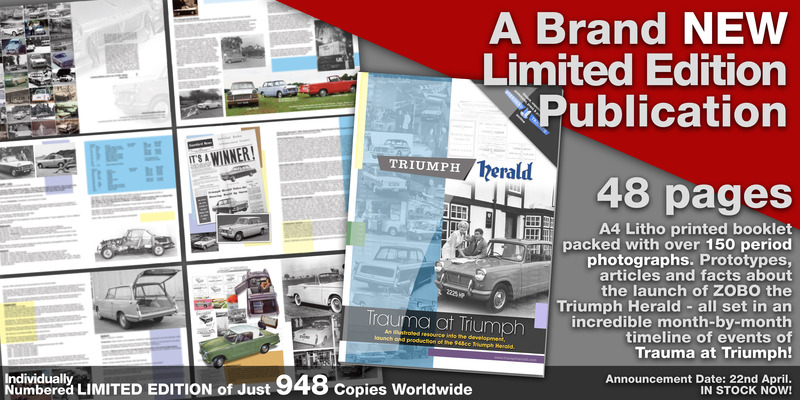 Triumph Herald illustrated development and launch timeline book now available. 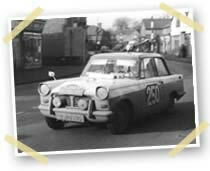 Since triumph-herald.com has started we have had a fanastic response from owners from around the globe, ex employees (and their families) from Standard Triumph and many NEW items of information added, to record the cars introduction. We hope with your help the website will continue to flourish and find out more information in the future; with your help and input. The database needs your help in compiling a listing of all the Triumph Heralds produced. A mammoth task so, we are firstly concentrating on early Triumph Herald 948 examples. If you can help us we'd love for you to get involved - get in touch with any memories, info, photographs of 948 saloons, coupes and convertibles. Today the early 948cc powered cars are very rare, with the Convertible being the rarest of the three styles with only a handful remaining, of which most are in Australia or USA. In the UK the remaining 948cc Convertible tally is just ten cars! Over 100,000 948 Triumph Heralds were made from 1959 and beyond its production life of 1961 with knock down kits being exported around the world. 1959 was a key year in the motoring world, seeing the launch of the Austin Mini, the Ford Anglia and the Triumph Herald. Over 100,000 948 Triumph Heralds were made from 1959 and beyond its production life of 1961 with knock down kits being exported around the world. The 948 Triumph Herald was available as a Saloon and a Coupe, then later as a Convertible. Styled by Italian designer Giovanni Michelotti, the Triumph Herald was an exciting design and introduced many new developments, such as all round suspension, whilst using traditional methods of a rigid chassis. Launched in the Spring of 1959, the Triumph Herald was warmly welcomed with the opening bonnet for accessibility and incredible turning circle proving a hit with the motoring journalists of the day. Not many Triumph Herald 948s now exist, with the Triumph Vitesse and later larger engined Triumph Heralds (1200 and 1360) being found in far greater numbers. This site is a tribute to the early Triumph Herald and an opportunity to find out more to what happened to all the cars - how many DO exist (DVLA have the figure around 300) and what happened to the cars that have not survived. Triumph Herald 948 owners, both current and previous, are encouraged to contribute to this site to build a comprehensive archive to the car. No accurate figures seem to exist, with official sources constantly changing with the discovery of 'new' Triumph Herald 948's found. Who knows perhaps one day we will be able to account for every car produced, but we cannot do this without your help and support. So if you do (or did) own a Triumph Herald 948, tell us about it. Good experiences, bad experiences, anything you can do to help the database grow - and as a thank you we have produced a Triumph Herald game for you to enjoy. To gain accurate information relating to the early Triumph Herald, focusing on the Triumph Herald 948cc saloon, coupe and convertible from its launch in 1959. To share the information more widely, throughout the world, to past and present Triumph Herald owners. To act as an open forum to promote the Triumph Herald name, marque and values to new followers of the Triumph Herald, by giving accurate information and history of the Triumph Herald and Standard Triumph around the late 1950's and early 1960's. To discover how many 948cc Triumph Heralds still exist. To accurately archive colours, styles and exports. Utilising many snippets of information; consolidating into one accurate (and easily available) archive.